There has been an increase in the level of mechanization in warehouses over a period of time. Cost and Quality of labor has become a pain point in this industry. Good workforces are expensive and increasingly hard to find. This is the reason for adoption of more mechanization in order to optimize the existing operations in warehouses. AEGIS specializes in Mechanization of Warehouses involving bulk materials. 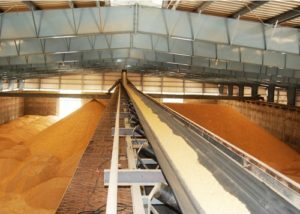 Mechanization of Warehouses / Godowns where large amount of bulk material is handled on continuous basis offers huge scope of cost saving through improving the efficiency of operations. We at AEGIS study the present modality of handling bulk materials carefully and accordingly conceptualize and install suitable means whereby handling material is made more efficient / streamlined. This involves incorporating tailor made system resulting in the following advantages. Very low per ton cost of handling material resulting in low pay back periods.